Well firstly in 100 days I will be lining up with a lot of other triathletes to complete the London Triathlon at Olympic Distance. The words OH DEAR should be in my head but instead the words in my head are CAN'T WAIT. The maximum I had gone on the bike was 11.84km, now I do 40km most weekends. I was injured with achilles tendonitis, now I run 3 or 4 times a week. I even have a PT to help me with running. I was only training once during the week, now I'm training a minimum of three times during the week and both days at weekends. I had hardly any sponsorship, now I have reached £600 (in pledged and Justgiving) which means I officially can do the triathlon. I was scared of running, now I embrace running thanks to the new found confidence I have gained from my PT. I was swimming once a week at best, now I swim two to three times a week. So a lot has changed in the last 100 or so days. I am approaching this challenge with a sense of enthusiasm and I really can't wait to line up at the start line in either of my triathlons this season. The first of which is in 44 days. Well what else have I been up to in the last 10 days. Well actually a hell of a lot. I've joined one of my Twitfriends (@curesam) challenge of one ironman a month throughout the rest of the year. Now before you all think I have gone mad, the total of my training in a month should be greater than the distance of an Ironman (3.8km swim, 180km cycle, 42.2km run). I was doing quite well after the Jubilee weekend but as I thought would happen the lack of cycling during the week is starting to hamper my progress. It is a good training tool and if anyone wants more details, please contact curesam. Wednesday thru Thursday last week were spent in London working. No time for training as I was too tired or busy. Friday thru Sunday were spent in Cardiff where I was lucky enough to gain media accreditation to photograph the ICF Canoe Slalom World Cup event. Some of my photos can be seen here. I was also invited out for tea by someone who works for Cancer Research one night, which was a very nice gesture and I had a cracking evening talking about my triathlon and other things. I even managed a session in the gym on Friday as the canoeing got cancelled due to the wind. My session consisted of a run, lots of leg weights another run and a swim. Monday thru today have been again spent in London but with a lot of time training. Monday night was a gym night after the football (note to self watching football while drinking coke is not the same as when drinking beer). I made the mistake of thinking the gym would be quiet. The session was a 15 minute run starting at 8.5km/h and increasing by 0.1km/h every minute. I'm not going to lie I had to have a breather after 10 minutes as I find running on a treadmill more difficult than outside due to the fact I get so hot. At least outside the wind cools you down. Tuesday night was a whole new experience for me. Some of my Twitfriends (@Annelovesthegym) train with a London based company called RG Active who specialise in triathlon training. They run open water swimming in a variety of settings across London so that people can get some time in their wetsuits before race day. RG Active were running a new(ish) session at Hampstead Heath, this was more or less round the corner from my work so I decided to pop along. It cost £10 but boy was it worth it. Due to no one else turning up for the first 30 minutes, I managed to get half an hours one to one tuition on swimming in wetsuits with the owner of the company (who used to be a professional triathlete). Now I consider myself a strong swimmer and I this session reinforced my belief due to Mr @RGActive claiming he had to work to catch me (WOOOOHOOOOOO!!!!!) but I learnt so much during this 30 minutes. that my stroke on my right hand side is too low and therefore not as efficient as my left. that swimming in a wetsuit gets more difficult the more tired you get as it constricts your chest. that open water swimming is a very peaceful experience as the lack of visibility and quietness are very calming. All in all well worth the £10. I can't thank my trainer enough and I will definitely be going again. From memory I then recreated my workout so I could get a distance to log on #12xIronman challenge. The route can be seen below. Next week I will be able to log this accurately as my Garmin 910XT has arrived as my bike and other bits and bobs sold. Can't wait to try it out over the coming week. Wednedsay's training consisted of a run outside. Thankfully the weather held out. In fact it was lovely. I was following the regime set by my PT that consisted of run for two lampposts, walk for one lamppost. Repeat for your normal run time. This was an ingenious way of getting me running. In total I completed 5.89km in a fairly respectable (given I walked between 35 and 40% of it) time of 00:44:19. My best 5km was 00:35:35. I was thrilled to bits with this and had I had some water I really believe I could have completed another lap of Regents Park. The total time was only 18% over my ideal race pace. I still can't believe how enjoyable I found this when just over two weeks ago I was on the verge of packing my triathlon quest in due to the running. My route can be seen below. I even managed to get lost on a circle. Who knew you has a left hand turn when running around a circle. I gave myself a night off from training on Thursday as I sense a hectic weekend with England playing on Friday, needing to go for a cycle and gym on Saturday and meeting my PT on Sunday. Night off deserved in my eyes. 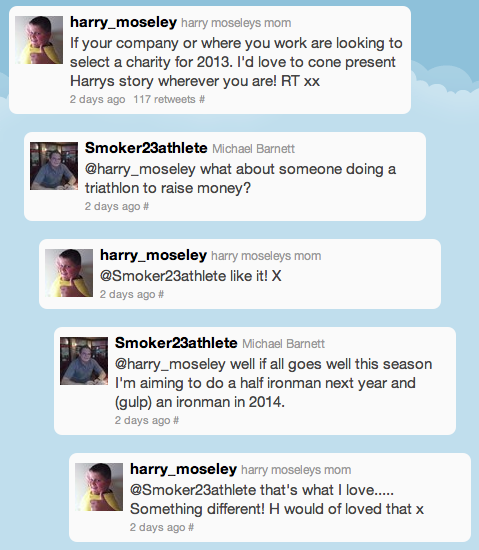 I saw the following tweet from Harry Moseley's mum on Twitter and contacted her about an idea I have had (conversation further below). Since I took up this challenge I have been keen to know how far I can push myself. I have been debating with myself on whether to "GO LONG" after these first two triathlons and have also been debating doing this for charity (sorry everyone but they are good causes). I saw this tweet and decided I would "GO LONG" provided that I enjoy my first two triathlons. Before everyone starts expecting this to be done, I must enjoy the first two races this year. If I do then the above is an aim I have and I will give it my all. What better charity to support than one which is new, but first let me get the first two out of the way. That's all from me folks. Remember you can still sponsor my via my Justgiving page or by texting NSMK50 £X where X is how much you would like to sponsor me. 100 days till the London Tri - I can't say I was counting! I thought I was a manfor stats but you've got me beat there! 100 days actually make it seem like ages away for me but I'm sure it;ll be hear in no time! The open water swim training sounded really good. I need to do something like that. I've only ever done three open water swims - 1 training sessioin, then 2 tri's. Looking back, I never performed anywhere near what I can do in the pool - but I can't blame the wetsuit. I did the ITU London Tri (Sprint) last year in the Serpentine and the water was warm enough so I didn't have to wear my wetsuit!. I like the fact you are trying to go for longer distances over the next couple of years - this has been my thinking over the last few months, to the point where I entered the ballot for the 2013 London Marathon - just to see if I could run that far!?!?!? Oh and thanks for mentioning the @curesam Ironman challenge. I can't remember if I officially welcomed you on board, so if not... Welcome! I use it as a way to break down my main goal (doing the London Tri) into smaller monthly goals and find it works well to get me out training. I hope it works for you too...!